+ it was a hit. i found several recipes on pinterest. we decided to go with this one. pour your glue into a bowl. fill the empty glue bottles up with water. give it a little shake before pouring the water into the bowl. stir it up and add a drop or two of food coloring. we went with gavin's fave - GREEN! add 1 tsp. of borax to 1/2 cup of warm water. slowly add the borax solution to your bowl. keep stirring! you'll need to use your hands to finish mixing it. So much fun, and such a handsome picture of Luc! Hi! I just found your blog and I love it! 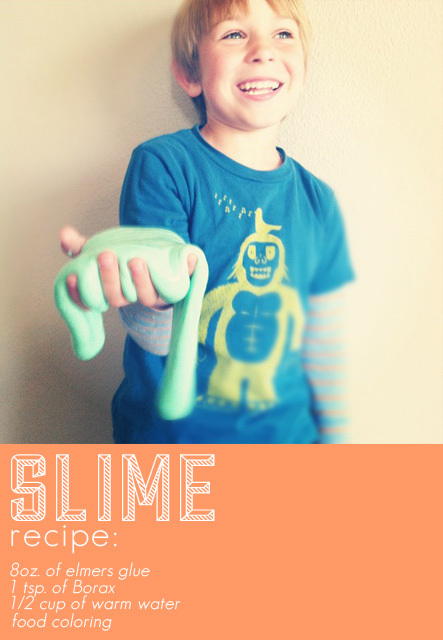 I'll have to wait to try the slime until my little one gets older, but it looks like so much fun! My kids and I will have to try this one. Love your photo and blog - happy I found you! Your recipe says to put water in the two 4oz bottles and add it to the glue. Then it says to use 1/2 cup of warm water with the Borax. The ingredient list does not specify that extra 8 oz of water...will this make it too watery or is it to be a part of the recipe? The 8 oz of water is in addition to the 1/2 cup of water used with the Borax. Have fun!